Yoga ain't just for chicks. 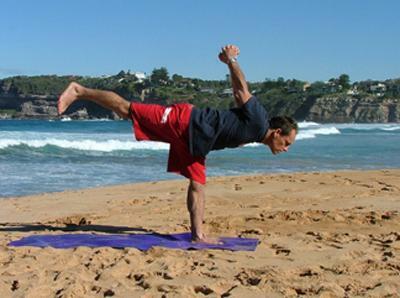 It can really help your surfing, and keep you away from the chiro and the physio. Specially once you get to the wrong side of 30 you realise that you're on that slippery slope downhill where stuff you didn't even know you owned starts to ache. Plenty of ou's out there are struggling with dodgy backs or iffy shoulders - so here's how you can kick em into touch. Yoga does plenty of good things, but from our perspective it gets you nice 'n flexible, improves your breathing (meaner you can hold your breathe for longer - and be safer out in the bigger stuff) and actually makes you stronger too. All things which make you surf better, which is the plan! Sun Salutations is a simple routine of 11 different poses that you cycle through to count as one set. Cool positions like Mountain pose, down dog, cobra...sounds like fun, hey!? Trust me, after 5 of these you're stuffed. Repeating it 10x and you'll have a sweat and get some cardio exercise at the same time. Generally I do 5 sets fairly quickly, and then the next 5 spending a bit more time in each position and really giving the muscles a stretch. So watch the video, and then print out the pic so you have something to follow when you're trying it at home. Don't try go for broke on the first attempt, just stretch as far as you can manage, else the next thing you'll go pull a poep-string or something! If it works for Garret McNamarara, the dude who's just ridden the world's biggest wave in Portugal, and world champs Tom Curren and Rochelle Ballard, then I reckon it should work just fine for you! So next time your foot slips off your board your hammy won't go pop and when you go for a hectic snap your back won't go crack. Happy days! And nothing like some serious downtime over the summer due to lack of surf to start working on a new stretching routine to get you 100's for next winter. Your local Virgin Active offers yoga classes, so go check em out. If World Champ Tom Carrol can do it, so can you! Maybe you can meet nice people doing yoga?